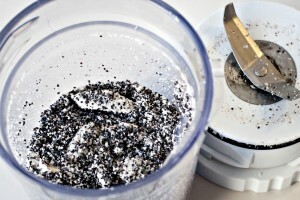 For the rest of you – Poppy seeds are common in baking in big parts of Europe and Northern America. They are considered healthy, and are tasty! 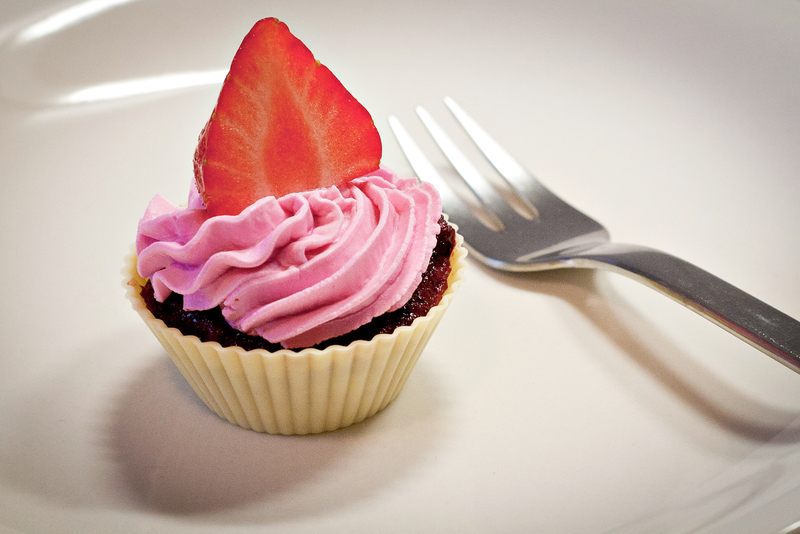 Today we’re making Pink Poppy seed Cupcakes – fit for a princess wedding. We’ll start with one beetroot. Peel, cut into pieces and place in a pot. I weighed the one I used – 150 g (1/3 lb) but this is so not very important. You could go with a smaller one – what ever you have. We mainly want the color from it. OK – add 100 ml (or ½ cup) of apple juice. 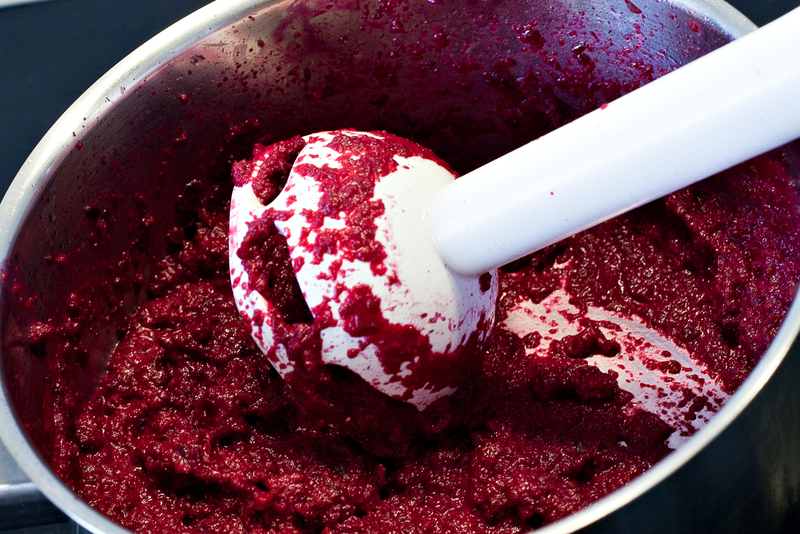 Exact amount is not important, no need to totally cover the beetroot pieces… Just a bit to splash around in. Let this simmer for about 30 minutes. I know – feels like forever, but that just fits our theme of a wedding :-). Meanwhile, get a small bowl and your mixer / grinder. 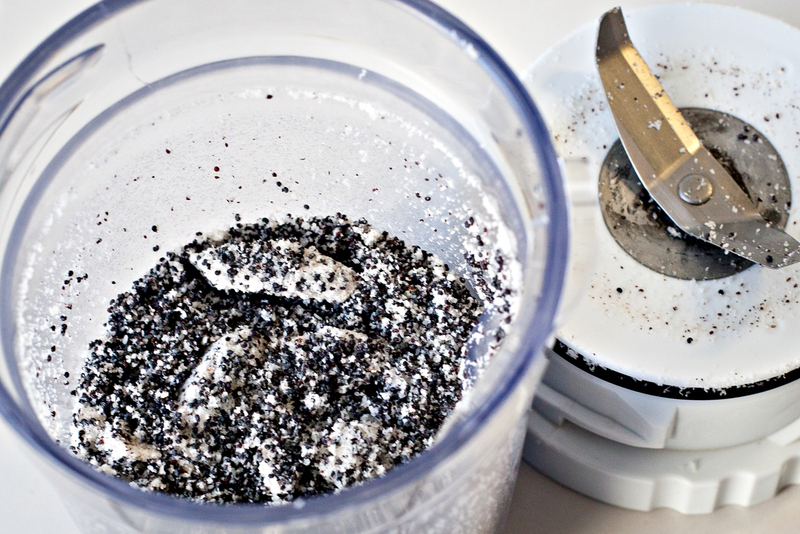 Mix 100 ml (bit less then 1/2 cup) shredded coconut with 100 ml (again, less then 1/2 cup) poppy seeds in your mixer / grinder and put in the bowl. We’re skipping the baking powder this time! Mix together the dry ingredients with a spoon and put to side for now. 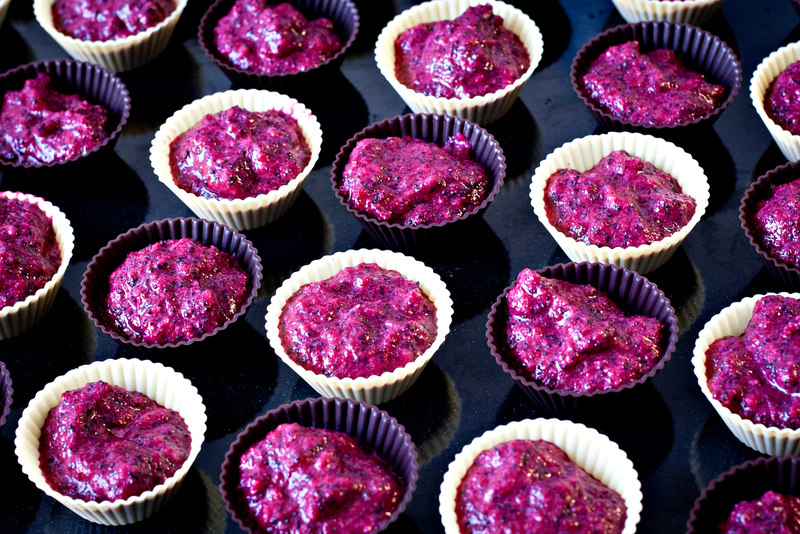 Get 250-300 g (about 2/3 lb) frozen raspberries out of the freezer and thaw in the microwave (or use fresh ones). Mash slightly and put to side. mash one or two bananas, depending on their size and your supply. a tbsp of honey, or two if you have a sweet tooth. I don’t know how quick you were so far – maybe you’ll add a few rounds of solitaire on your Iphone… BUT once the beetroots are done, you’ll want to drain the fluid INTO A GLASS OR BOWL. Don’t throw it out! Look at that color!! We’ll use that in the topping. And now turn around and throw away the artificial food-coloring bottle you have in the cupboard. Please! (At least the red / pink ones, ok?). Leave the fluid to cool down. Add 40 – 50 g (0.1 lb) butter (or ghee or coconut oil) to the beetroots (still in the pot) and mash them. Then use a hand blender to make a puree of it – and this is when things might really get messy…. Careful, or you’ll need to clean the walls afterwards! Well, then, now you just have to mix everything. Add raspberries, beetroot mash and dry ingredients to the egg and banana mix – and stir. Ahhhh – the color!! Dark red! Fantastic! Time to turn the oven on. 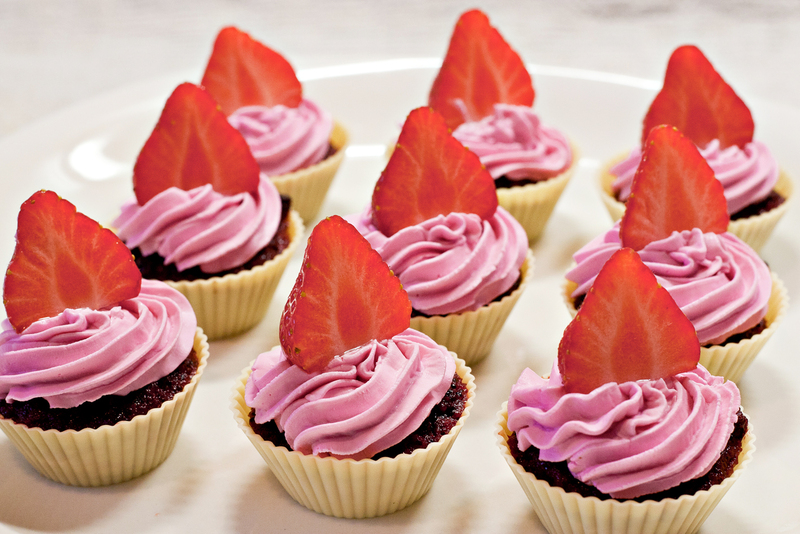 180–200 C (350-390 F), and line up cupcake forms on a baking tray. I would strongly recommend using silicon forms, as they are non-stick – or use muffin trays and grease them. But if you don’t have this – use paper forms (double). I used minis since the cupcakes then looks adorable and will be bite-sized. Fill your forms – pretty much full! They don’t rise much so don’t worry. And there we have the base for our cupcakes! 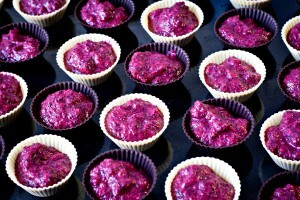 This first bit can be done a day or two in advance if you want to – then store them (and the red beetroot fluid) in the fridge . Now the topping. I use mascarpone (Italian crème cheese) because it’s very easy to work with and it’s very rich and creamy. 150 g (1/3 lb) mascarpone will be good for about 10 mini sized cupcakes. 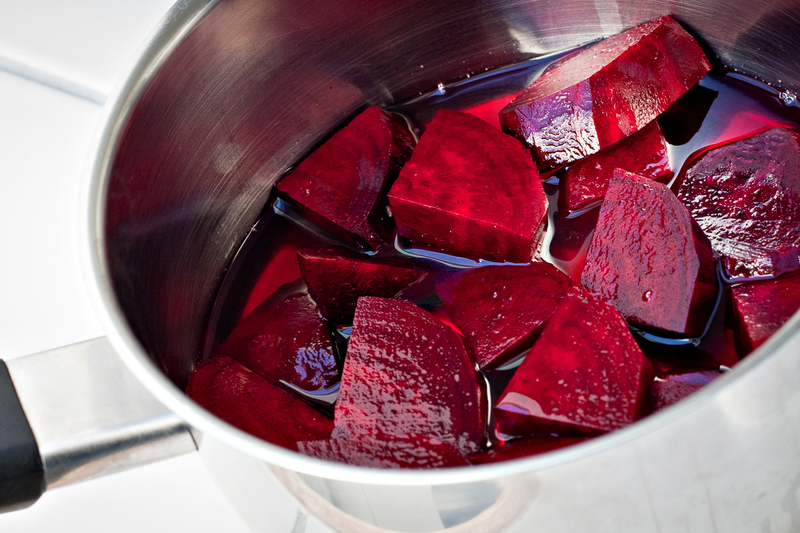 Put in a bowl and add about a teaspoon of the dark red beetroot fluid, a few drops of honey and stir. Fill your icing bag / pastry bag – or if you don’t have one, fill a small freezer bag and cut off one corner. 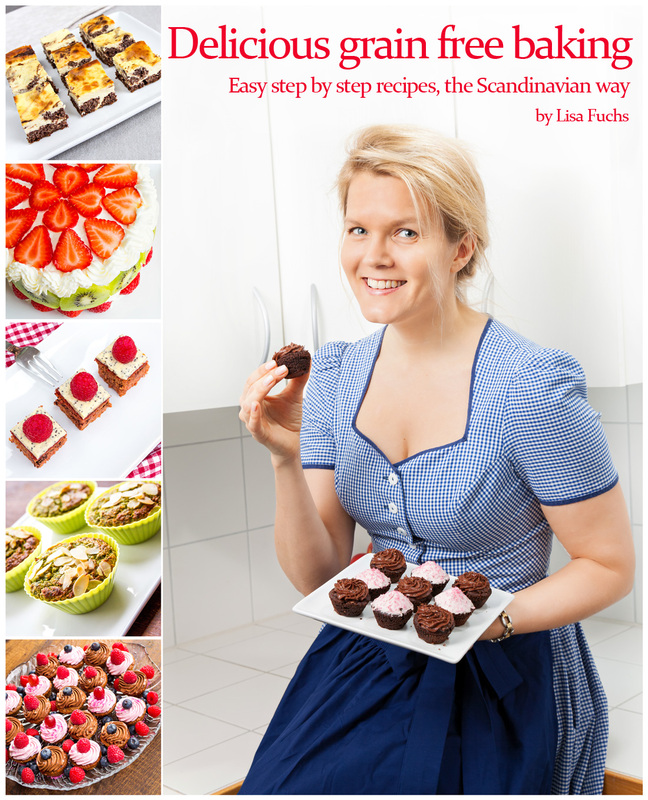 Work in a spiral slowly, from out to in, to decorate the muffin. Then top each, with a half strawberry or a raspberry. Gorgeous! Now quick – Hide them far back in the fridge until the guests arrive, or you’ll be tempted to munch them all down in one go!